The quest for a full head of healthy-looking hair may seem from afar to be nothing more than vanity. But sometimes there's more to it - especially if you're a balding woman. "When women have thinning hair, we sometimes start to look less healthy and vibrant," said Mahri Martens-Tomas, who developed a hair-augmentation process that some professional women say has improved their confidence in the workplace. Adams County Department of Social Services business manager Venita Kroll has been a Martens-Tomas client for three years and swears by the results. "When you're 45 and competing for a job against people in their 20s, even if they don't have experience, a lot of times the 20-year-old will get the job," Kroll said. "How you look is important. And if the employer isn't having to see someone who looks old and decrepit, it helps a lot," she said. Stress caused Kroll to lose hair. She considered many different solutions, but nothing looked good. Then she met Martens-Tomas. At Martens-Tomas' Denver business, also called Martens-Tomas, she attaches microtresses - small bundles of human hairs - to thicken or lengthen a client's existing hair. The bundles contain an array of colors to match the client's natural hair. Each microtress contains a permanent bond that holds the unit together, and a secondary bond, used to attach it to a client's hair. "It feels like my own hair, just more of it," Kroll said. "And no one can tell the difference." Martens-Tomas says the two-bond system allows customers to reuse the microtresses for up to 20 years. When the temporary bond comes out, the client can take the microtress back to Martens-Tomas, get new ones put in, and the company will clean and rebond the old ones for later use. "It's like winter clothing," Martens-Tomas said. "When you are done wearing it, you clean it and store it until you're ready to wear it again." Martens-Tomas didn't invent the concept, but she did redevelop existing methods for solving the problem of thinning hair. "I paid my way through college by modeling and teaching modeling classes, so I was always working with great hair," Martens-Tomas said. "Eventually my hair began to thin, and the thinner it got, the more insecure I felt when giving presentations. Martens-Tomas earned an undergraduate degree in mathematics and began looking for answers as though she were solving a math problem. In 1988, she started researching the hair industry and going to different salons for advice. But she couldn't find anything she liked. "Some of them bond hair with an adhesive that can only be removed with a harsh solvent, damaging my already thinning hair," she said. Others felt bulky and looked fake. 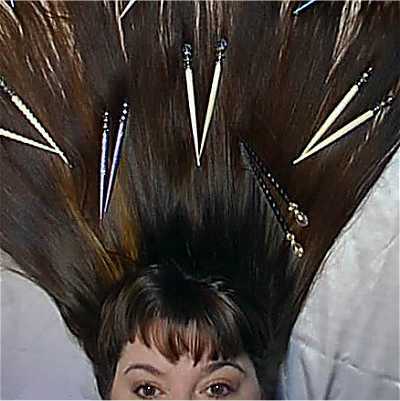 "There was even one that crimps a metal bead to affix your hair to the fake hair. The process was supposed to take 10 to 12 hours," Martens-Tomas said. She decided to develop her own system after disappointing results from what was considered the top medical hair clinic in the country. Martens-Tomas went into business with her own process and line of products in October 1990. Since then, Martens-Tomas' clients have included entertainers, businesswomen and people who have lost their hair because of surgery or an accident. "We use Indian hair that has never been processed," said Ulia Ennis, Great Lengths salon support specialist. "We also use a wool-industry coloring process to get the different colors, so the hair cuticle stays intact." Great Lengths hair extensions are attached mechanically. "The machine warms the (keratin protein) bond so we can mold the extension onto the client's hair on a molecular level," Ennis said. Ennis also said the keratin bond does not damage hair. "Natural hair expands when it is wet. Unlike the wax and glue bonds, our keratin bond acts like the client's hair and shrinks and expands with it," she said. The procedure can be done at any Great Lengths-certified salon. Yolanda Johnston, owner and master stylist of Collage Hair Skin & Nails, soon will begin offering Great Lengths at her Aurora salon. Johnston, who has been in the business for 30 years, says the system is a great improvement over past procedures. The national average cost for Great Lengths' procedure is around $2,000, Ennis said. These extensions last four to six months and must be removed at the salon. With Martens-Tomas, an above-the-shoulder look will run about $2,500, including the line of hair-care products, styling tools and other hair accessory items. A shoulder-length 'do will cost about $4,500. And mid-chest-level tresses will run about $6,500. "One client spent as much as $12,500 to get hair down to her waist," she said. To maintain the new tresses, the average client needs one hour-long session with Martens-Tomas every month, at a cost of $120 per hour. "We can also split the time into different sessions. For example, some may want to come in for half an hour twice a month, and others may want to come in for two hours every other month," she said. Great lengths is a standard keratin fusion strand by strand extension process. The strands are ultimately removed by application of acetone to the bonds, which can cause damage to any but the coarsest hair in the best condition. Also, the new growth has usually matted and formed dreadlocks which are damaging to remove. Generally women with fine thin hair are poor candidates for most types of extensions and would be better off trying integration hairpieces. I do great lengths and have not had any of the problems that you mentioned. All my current clients are very happy with there hair, BUT I do a very intence consult to decide who is a good canidate and who is not. What method(s) do you use for putting in your extensions? Currently I do bonded extensions, all human hair,and clip in ones that come real human hair, or synthetic. What type of client (hair type?) do you typically turn away from getting great lengths? I have very thin hair (& not a lot of it) & I have great concerns about the stress that this would put on my own hair. Any thoughts/ advice? Hi, plp1971. I'm not a beautician, but I think your concern over the stress on your hair is valid. The extra weight of the added hair is definately a potential problem. I think if you chose to go w/extensions that it would limit the length you could accomodate. Hopefully a beautician will chime in here!